CHANGE IS UNIVERSAL LAW - IS IT YOUR TIME FOR A CHANGE? LATEST STATE OF THE ART Q-SWITCHED ND YAG LASER — Our Q-Switched laser provides the versatility to easily change between wavelengths to successfully remove black, brown, cyan, red, blue, coffee, yellow and other color ink. MAXIMUM COMFORT DURING TREATMENT — Tattoo removal is less painful than getting a tattoo in the first place. The sensation is similar to having a rubber band snapped on your skin. We provide the skin chilling during the session, and if you choose you may use our prescription topical anesthetic cream. We offer ice packs after the session if needed. SAFETY & MINIMAL RISK — All treatments performed by Certified Laser Specialist. All treatment protocols and procedures are overseen by SPA medical director Dr. Aubrey Copeland. He has an extensive experience directing multiple Med SPA and laser clinics, including Rocky Mountain Laser College. He ensures our med spa treatments meet the highest professional standards by overseeing the treatment protocols, procedures and providing the training and tests to the med-spa practitioners. Dr. Aubrey Copeland is available to consult with any patients who need the advice before or after med-spa treatment or if the need for medical care arises.We take your safety seriously. The laser goes after the tattoo pigment, leaving the surrounding skin virtually untouched. The energy from the beam is transferred to the ink and breaks it into small particles, making it easy for the body’s immune system to “digest” and remove the small broken ink particles naturally. A: No, one treatment is not going to do it. Multiple treatments will be required and unfortunately, the number of sessions isn't something that can be predetermined exactly during your initial consultation. Each session will produce some level of fading. Tattoos are comprised of layers of ink, stacked on top of one another. This thick concentration of pigment particles cannot be completely broken down in one session. At Enlighten Tan & SPA we will break up as much ink as possible in every session. Location of your Tattoo matters in most cases. Fading is generally slower for tattoos located further down the arms or legs as they are further from the heart. The closer the tattoo is to the heart the better circulation, therefore better results. Q: Can all the colors be removed from my tattoo? A: At Enlighten Tan & SPA we can remove most colors to a point where they're nearly impossible to see. Some colors require more treatments than other. All inks are removed best at specific wavelengths of light. Q: What is a potential risk and side effects after a treatment? A: There are a handful of symptoms you might see post-treatment. Among them are blisters, swelling, raising of the tattoo, pinpoint bleeding, redness, and/or temporary darkening. These are common and usually subside within one to two weeks. Some of the ink used in cosmetic tattoos, including colors containing white ink, may darken (oxidize) immediately after treatment because of the presence of titanium dioxide. This can usually be corrected with further treatments. There's a higher risk of hypo pigmentation with tattoo removal on darker skin tones because the laser may remove pigment from your skin along with pigment from your tattoo. It will be discussed during the initial free consultation and we will do a test spot to minimize any risk if we find it necessary. More details and risk disclosure will be discussed during free consultation. Q: How long do I have to wait before having my next treatment? A: 6-8 weeks is the required time between treatments. Lighter skin tones can usually go shorter intervals. The skin needs to recover before a subsequent treatment is done. The lasers fragment the ink in your tattoo so that your body's immune system can finish the removal process, and this takes time. When your tattoo is exposed to laser treatments too frequently, the risk of discoloration (pigment change) and scarring increases greatly rather than shortening the time of removal-no matter who is doing it and no matter what type of laser is being used. Allow your body to remove the ink in the area and heal to avoid complications. Q: Are there limitations after laser tattoo removal treatments? A: We recommend to limit your physical activity for the first 24-48 hours to avoid irritation or harm to the treated area. You can resume your normal physical activities after that. Sun exposure or artificial tanning should be limited until the treatment area is completely healed. Q: Can you remove permanent make-up? A: No, we do not treat permanent make-up as there are several risks associated with it. 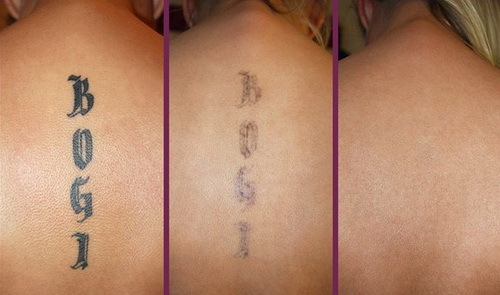 Some cosmetic inks have metallic bases and tend to turn black when treated with the laser. Once this darkening occurs, it takes much longer to remove. Q: Can I purchase just one tattoo removal treatment at a time? A: Yes, we have a simple price structure based on the single area like S up to 4", M up to 8", or L up to 12". Since no tattoo can be removed in one session, we also offer 6 pack discounts and extra discount for single sessions if needed after initial 6 treatments of the same area to save our clients money. Most clients buy 6 pack first and it may be sufficient for their tattoo removal. This flexible price structure allows clients to make further decisions based on the results of received treatments. Q: Will I have scars, blisters and scab after treatment? A: Although blisters and scabs can be a normal response to tattoo removal, most patients will not experience them. In the case that you do, it is important to not pop or pick at them. If the blister pops on its own, keep the skin over it covered with a healing ointment and gauze to promote healing and prevent scarring. Permanent raised scarring may occur but it is rare. A: This depends on your tolerance to pain. The good news is that for most people the pain is less to that of getting a tattoo. Some compare the sensations to snapping a rubber band at your skin. The treatment is very fast, and afterwards, it feels like a mild sunburn. Patients can request numbing cream and ice to apply 30 minutes before the treatment. This will help significantly reduce the pain. It will be discussed further during free initial consultation. Q: What should I do to prepare myself for tattoo removal treatment? A: Prepare for your appointment by being well rested, nourished and hydrated. Cancel the procedure if you become ill. Come to the appointment wearing comfortable clothing that allows easy access to the tattoo and won’t chafe the site after the procedure. Tell us about any medical concerns. Let us know if your health changes between appointments. Tell us if you’re pregnant or nursing. Before an appointment, inform us if you have cold sores or herpes. You may need to consult your doctor about taking an antiviral medication according to your doctor's instructions before the appointment. Don’t expose your tattoo to the sun, use self-tanners, spray tans and tanning beds for four weeks prior to laser removal. Don’t wax or use a depilatory for 1-2 weeks before a treatment. Avoid skin irritants. Don’t engage in overly strenuous activity before a procedure. Feeling rested is important to recovery. Q: What should I do after I am treated? A: After care treatment instructions to take home will be provided during the consultation or at the first treatment appointemnt. Proper aftercare is not complicated but necessary to prevent infection, skin texture change, or other unwanted side effects. Tattoo removal is a relatively simple procedure, but we take care to inform you of the important steps you can take to achieve a great result. Q: How often do I come in for a Laser Tattoo Removal treatment? A: We recommend that our clients schedule their appointments every 6-8 weeks apart for best results. We will not schedule appointments under 6 weeks apart. After you have received 6-8 sessions, a touch up package may be needed spaced out 8-12 weeks apart until all the hair is removed.